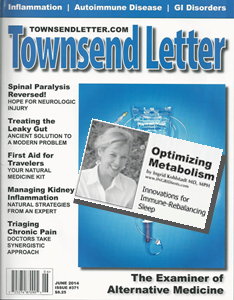 Treatment of most autoimmune disorders, the theme of this month’s Townsend Letter, involves rebalancing the immune system. Immune restoration is an offline process that occurs mostly during sleep. In some ways it’s analogous to defragging a computer. So here’s the rest of my story. Making a bedroom a healing sanctuary can be both time-consuming and costly. The market space is crowded, making it difficult at times to separate hype from science. That said, the healing potential of two products stood out to me as I field-tested them. In response to this favorable impression I spoke with experts and manufacturers, researched the products and present them as a heal-while-you-sleep approach to autoimmune disorders. Many clinicians and their patients with autoimmune disorders are familiar with bee stings and the topical use of honey. Propolis is a less well known bee product with antimicrobial and immune- regulating properties. Medicinal uses trace back to ancient Mediterranean cultures. Propolis is often called bee glue and bees make it from floral extracts, and 80 phytonutrients have been identified. Originating from the Greek, propolis literally means “before the city,” and bees use it at the hive entrance to fortify the walls. Fresh propolis is also used to coat the cells in which the queen will lay her eggs, and light coats are applied to filled and sealed honeycomb. Today’s marketplace offers gumdrops, chewing gum, supplements, tinctures and toothpaste which tout propolis as an active ingredient. However, I recommend patients avail themselves of propolis therapy via the respiratory route. The linings of the respiratory tract tend to be a minimally-supported part of the immune system, despite the daily front-line challenges of chronic mild dehydration, inadequate vitamin D and poor indoor air quality. Aerosolized propolis has additional benefits over oral supplements. Given the antimicrobial properties of propolis, one might reasonably anticipate it could reduce mold spores. Dr. Marla Spivak is an entomologist from The University of Minnesota who has initiated research along these lines. To most people propolis is a pleasing aroma. Olfaction may be a route by which propolis confers its immune benefits. The scientific basis for aerosolizing phytonutrients is well-summarized in The Sweet Smell of Success authored by anesthesiologist James L. Geiger, MD. I highlight that frankincense, orange, lemongrass, melaleuca, oregano and thyme are used in aromatherapy for the treatment of autoimmune conditions. Makes it easier to use for young children. Minimizes potential effects on the gastrointestinal absorption of medications. Potentially expands acceptability to patients adhering to a vegan diet who might not be willing to ingest products derived from bees. Allows use in a clinic setting both for demonstration purposes and treatment. The L1 module propolis diffuser simply heats propolis and is probably sufficient for bedside use during sleep. The cartridges holding propolis were formerly made of aluminum and are now manufactured in glass. Sometimes the word “capsule” is used to refer to the diffuser cartridges. Health care providers may consider refraining from using the word “capsule” since in American English “capsule” is often understood as something to ingest. The organic propolis cartridges are labeled BIO, which is the European term for organic beekeeping. To maximize the benefit, use the propolis diffuser at bedtime and do not run a Hepa filter or open the window while using the propolis vaporizer. The vaporizer is most effectively used after the room is filtered or aired out. Purchases for medical uses offer often-overlooked cost-savings. A physician’s prescription for a propolis diffuser or mattress makes the purchase sales tax exempt. The prescription may qualify the purchase as a medical deduction, as determined by the patient’s income tax preparer. Additionally the purchases are reimbursed by some insurance plans, in which case companies with outstanding service may assist inthe needed prescription wording. Efficient sleep now has a broader meaning. Sleep time offers opportunities for toxicant reduction and nutrient uptake which have scientific merit as being supportive of the immune system.